The majority of adults do not consume the recommended intake of essential micronutrients. Food fortification and supplementation provide manufacturers with the opportunity to enhance the health and wellbeing of consumers, enabling them to easily take in the vitamins and minerals complementing their daily dietary routine and filling the gaps. Two webinars will be dedicated to this broad topical field. The first session will focus on the science behind and the role of food fortification and supplementation in combating micronutrient deficiencies. The webinar will be presented by Prof. Balz Frei, Director and Endowed Chair of Linus Pauling Institute, and he will be joined by DSM’s Prof. Manfred Eggersdorfer and Jacob Bauly. 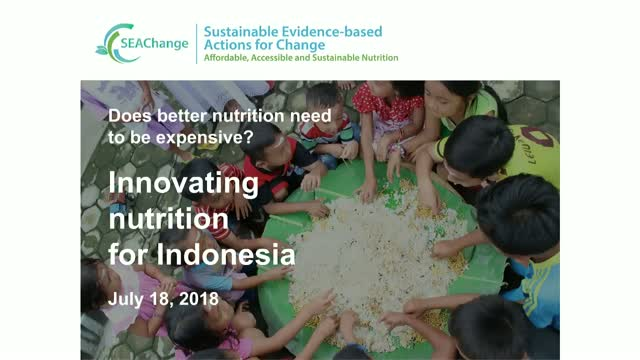 They will present the impact of food fortification and supplementation on public health, share examples of strategies, and explain how the benefit of fortification and supplementation can be measured. They will also cover nutrient density and how it frames the value of food fortification and supplementation. Vitamin D intake is low among the world’s population, which is a major contributor to clinical deficiency and a persistently high prevalence of low vitamin D status, particularly during wintertime at high (or low) latitude. Vitamin D deficiency contributes to the development of nutritional rickets in children and osteomalacia in adults, both seriously debilitating conditions that are completely preventable with an adequate dietary supply of vitamin D and calcium. Regardless of which international recommended intake is selected, the current supply of vitamin D in commonly consumed foods makes it unfeasible for most people to meet their dietary requirements for vitamin D without supplementation. Emerging scientific evidence from the EC-funded ODIN project suggests that many foods, including fish, eggs, meats as well as dairy products could be part of a public health strategy for vitamin D deficiency prevention in the population. This would positively impact public health in a cost-effective and inclusive way. While most European countries are impacted by suboptimal vitamin D status, Finland is the exception. In 2003, the country introduced a national regulation which includes mandatory fortification of milk and margarine spreads. The population has now achieved a vitamin D status of 75nmol/L. Recently, the Swedish National Food Agency (NFA) proposed to introduce a similar regulation that will go a step further by extending the products subject to mandatory vitamin D fortification. *This information is solely for scientific informational purposes only and not intended for marketing and/or sales claims purposes. Vitamin D has traditionally been closely linked to bone health. It prevents rickets in children, as well as lowers the risk of fracture and osteoporosis in adults and the elderly. The links between vitamin D and bone health will be highlighted as part of the upcoming World Osteoporosis Day on 20th October 2015. Articles discussing the diverse positive effects of vitamin D have recently been hitting the headlines, with 3,500 studies published every year and ongoing research into its emerging health benefits. Despite this, 88% of the global population have low vitamin D intake due to poor nutrition and sun exposure. There is still a lack of knowledge among consumers about the long-term effects of vitamin D deficiency. Join our webinar on vitamin D and its health benefits, which will be presented by the acclaimed scientist in biochemistry and molecular biology, Dr. Bruce Ames. He will be accompanied by DSM’s Prof. Manfred Eggersdorfer and Jacob Bauly. They will present the latest findings on vitamin D and the emerging benefits across different life stages and conditions. Dr. Ames will also discuss his groundbreaking triage theory, which demonstrates that when micronutrients are scarce, the body uses them to compensate the episodic shortages at the expense of long-term survival, which leads to potential DNA damage and negative effects on human health. Vitamin E is a powerful antioxidant, an essential nutrient needed to maintain cellular structures and functions, thus helping support health. However, intake still remains low among consumers globally. There is an ongoing discussion about the optimal vitamin E status in healthy populations and its role in maintaining liver and brain function outside of nutritional recommendations. New and ongoing research suggests that vitamin E at higher doses may help maintain tissue function in specific risk groups, such as age-related macular degeneration, Alzheimer’s disease and non-alcoholic fatty liver. Applications like these require the advice and supervision of health care professionals. It is important to revisit both the required doses and safety for targeted vitamin E intakes for these conditions. Further research will be required to support qualified health claims for mitigating the outcomes of these diseases. Join the latest webinar in our series on research related to vitamin E. Hear our speakers Prof. Jeffrey Blumberg and DSM’s Prof. Manfred Eggersdorfer and Jacob Bauly present their latest findings on vitamin E safety and its implications on the recommended intake across different life stages and conditions. In our aging society, Alzheimer’s type dementia is a major concern. The disease can have a devastating impact on quality of life, with patients relying on caregivers for standard daily living activities. Whether it is memory impairment, deterioration, confusion or anger suffered by patients, this highly disruptive neurological disease demands attention. Vitamin E is vital for neural function and its deficiency can lead to neurological dysfunction, causing problems with co-ordination, balance and speech. It also has an antioxidant function in the brain – as a free radical scavenger and constituent of neural membranes, preventing the oxidation of lipids and PUFAs. Now, recent studies have found that maintaining a high level of vitamin E results in marked improvements for mental health and can be linked individually with a decrease in the onset of Alzheimer’s type dementia. Join our webinar and hear our speakers Prof. Maurice Dyksen and DSM’s Dr. Manfred Eggersdorfer and Jacob Bauly present their latest findings on vitamin E and its potential role in curbing the onset of Alzheimer’s disease. La malnutrición es un problema general a nivel mundial, ya que las personas no consumen el nivel suficiente de nutrientes esenciales. A su vez, la obesidad se ha convertido en una preocupación creciente porque se consumen demasiados alimentos para el nivel de actividad. A este ritmo, la sociedad actual no podrá cumplir con los objetivos de la Asamblea Mundial de la Salud (WHA) 2025 en materia de nutrición y es esencial que los programas de nutrición se desarrollen aún más para mejorar la situación nutricional. La fortificación de los alimentos es una manera efectiva de producir alimentos altamente nutritivos y combatir la malnutrición y así lograr un mejor desarrollo socioeconómico. La industria de alimentos, bebidas y suplemento dietario cumple una función clave en la promoción de la nutrición de la salud pública al desarrollar opciones nutritivas, saludables y asequibles para los consumidores. En este seminario web informativo, el experto independiente Alfonso Valenzuela Bonomo junto con Hector Cori de DSM, director de Nutrition Science & Advocacy LATAM, debatirán sobre la necesidad de la colaboración entre sectores (gobierno, organizaciones civiles y empresas) para combatir la malnutrición. The global market for eye health ingredients is increasing fast with a projected compound growth rate of 5.9% until 2019 . The innovation is no longer focusing only on age-related macular degeneration. Supplementation can be beneficial to healthy people of all ages to achieve optimized visual performance and comfort. DSM, Kemin and the University of Georgia have recently published a new study to show how lutein and zeaxanthin supplementation can help younger, healthy people improve their vision, such as the ability to see objects under glare conditions. Join our webinar and hear lead author Professor Billy R. Hammond Jr. and DSM’s Jens Birrer and Wolfgang Schalch present the latest findings and explain what the new science means to the market. Frost&Sullivan (2013). “Strategic Analysis of the Global Eye Health Ingredients Market”. Fatty liver – and the focus is on fatty liver caused by lifestyle, not by alcohol - is a growing issue worldwide. A non-alcoholic fatty liver is frequently associated with obesity, insulin resistance and diabetes type 2. Today, there are approximately 1.5 billion overweight or obese people worldwide, and more than 300 million have diabetes type 2. Non-alcoholic fatty liver is also observed in 16% to 20% of normal weight individuals, and often has no symptoms. In this informative webinar, independent expert Dr. Arun Sanyal – a leading scientist from Virginia Commonwealth University – joins DSM’s Dr. Manfred Eggersdorfer, Professor for Healthy Ageing at Groningen University, and Jacob Bauly to present the latest research on the role of vitamin E supplementation in limiting the negative health implications of fatty liver. The results of several human studies have demonstrated that vitamin E was found to be effective in reducing the onset and development of a non-alcoholic fatty liver, was safe in the applied dose and did not lead to side effects such as weight gain. Currently, there is no approved drug for the treatment of a non-alcoholic fatty liver. It has been shown that vitamin E directed at a defined daily dose improves the liver condition in non-diabetic adults with a non-alcoholic fatty liver. Title: Does better nutrition need to be expensive?